Dental implants look, feel, and act just like natural teeth, offering a long-term solution for the replacement of missing teeth. Dr. Avi Malkis is an experienced implant dentist at Larchmont Family Dental, placing high-quality dental implants for patients of all ages in the Westchester County of New York, including Larchmont, Mamaroneck, Harrison, and New Rochelle, New York. To learn more about dental implants, call the office or schedule an appointment online. Missing teeth can lead to deterioration and bone loss in your jaw. Missing teeth can make it difficult to chew and swallow, resulting in problems with diet and nutrition. Missing teeth can put more stress on your other teeth, causing cracks, fractures, and additional tooth loss. Missing teeth can eventually cause facial collapse and contribute to a “sunken in” look. Missing teeth can also affect one’s psychological and social well-being. How can implants help restore my missing tooth or teeth? Dental implants restore your smile — they function as artificial tooth roots that are anchored to your jawbone so that Dr. Malkis can then place a crown or a bridge. Unlike other forms of dental restoration, implants don’t rely on other teeth for support, so they’re stable and permanent. Dental implants are also long-lasting. While dental bridges can last up to seven years, with proper care, dental implants can last a lifetime. Before the procedure begins, Dr. Malkis gives you local anesthesia so that you won’t feel anything during the process. Then, he inserts the implant root -- a tiny, titanium, screw-like post -- into your jawbone under the gums. Finally, you wait while your jawbone heals and grows around the post in a process called osseointegration. Depending on where the implant goes, this process can take anywhere from three to six months. After the implant integrates to your jawbone, Dr. Malkis attaches a connector called an abutment above the gums. He can then place either a crown or a bridge over the abutment. Depending on your circumstances, Dr. Malkis may perform an immediate implant. That's when he inserts the implant root immediately after a tooth extraction. He can then place the implant-supported crown or bridge right away. 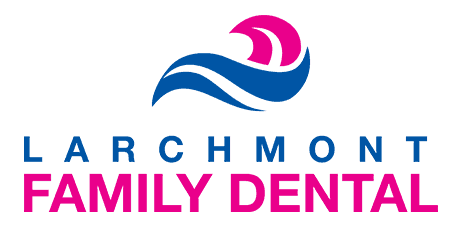 If you’re interested in learning more about dental implants, call Larchmont Family Dental today or schedule an appointment online.